Big news broke recently when Michael J. O’Brien, VP of corporate and product planning at Hyundai Motor spoke about the automakers plans to launch a pickup truck in the United States. This decision is a critical countermeasure to the rapidly changing automotive marketplace and is designed to catch them up with a shift away from sedans in North America. 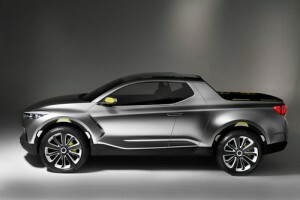 When speaking to Reuters, O ‘Brien said Hyundai’s top management has been given the green light for development of a pickup truck similar to a show vehicle called the Santa Cruz that U.S. Hyundai executives unveiled in 2015. O ‘Brien’s statement is important for a number of reasons, not the least of which included the news that Hyundai plans to introduce three other new or refreshed SUVs by 2020. But it’s the phrasing of his statement that is most important to this article: “a pickup truck similar to a show vehicle called the Santa Cruz”. Unfortunately, that means we aren’t going to see the concept vehicle we all loved go into production exactly as it was shown, and that we can’t be exactly sure what Santa Cruz will look like when it finally hits the market. Most insiders agree it likely will not be available until 2020, and we hope the concept won’t evolve into something too far from what we’ve seen because the original 2015 Santa Cruz concept was brilliant. Under the plan, Hyundai Motor recently announced the new compact Kona crossover and plans to roll out a new version of its Santa Fe Sport mid-sized SUV next year, followed by an all-new 7-passenger crossover which will replace a current three-row Santa Fe in early 2019. A redesigned Tucson SUV is also expected in 2020. In its final production form, we still expect the Santa Cruz to be available in only one configuration—a four-door, SUV-based pickup with a (possibly) extendable bed and seating for five. As far as towing capacity goes, don’t expect it to pull more than 2,500 pounds, as this will be a compact lifestyle truck, not a full-sized workhorse. 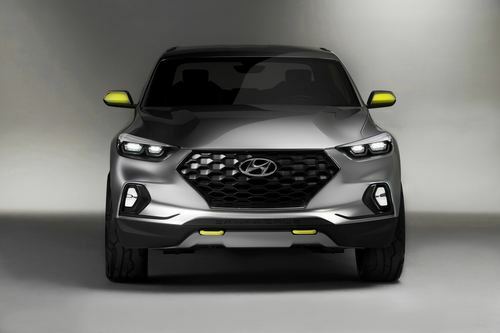 “Santa Cruz is intended to attract CUV, SUV and sedan buyers who are seeking greater utility, without the compromises that traditional trucks often require,” Hyundai USA CEO Dave Zuchowski has said. That sounds very much like the same demographic Honda has targeted with its second-generation Ridgeline, but keep in mind that Santa Cruz is expected to considerably smaller and cheaper than Honda’s premium car-like truck. 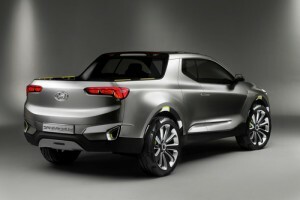 The news of Santa Cruz’s immanent production is exciting for a number of reasons, not the least of which is Hyundai’s commitment to establishing a new category of vehicle with a completely unique pickup/crossover that should be unlike anything else on the market. Stay tuned to these pages for more information and mark on your 2020 calendars that you’ll be making time to test-drive a Hyundai Santa Cruz.